Lenbitz - A Worldclass Window Covering Systems, has a unique and wide variety of window blinds with wide range of fabrics, designs, patterns to suit your room, office decor. 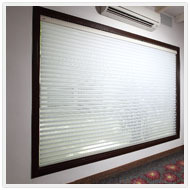 Our Blinds comes with an option for manual and motorised mechanism with remote control. The International bestsellers, the Blinds that give you the power to decide : levels of Visibility. • Full • Partial • Blackout. • Or Both. at a level of your choice. • Sill level. • Quarter Level. • Mid Level. • Full Level. in a colourful range of polyester fabrics that suit the interior and exterior designs. • magic • combi. • iris. • oslo • cyon • parole. magic • combi. • iris. • oslo • cyon • parole.